An argument between a local couple led to a charge of domestic assault being levied against the husband on Sept. 4. Cannon County Sheriff’s Deputy Seth Perry was dispatched to 166 Petty Gap Road that day in reference to a domestic assault in progress. Upon arrival he was met on the porch by Audry Lulow, who said her daughter and her son-in-law, Dillion Reger, were arguing inside the home. Deputy Perry went inside and saw Reger standing in front of his wife, who was sitting. Reger was yelling at her. She was crying. The deputy asked Reger to step outside on the porch and have a seat, which he did. Deputy Perry observed some faint red marks on the victim’s neck. He also obtained written statements from the victim and Lulow. He referred the wife to the Cannon County SAVE domestic violence assistance agency and informed her of her rights as a victim. 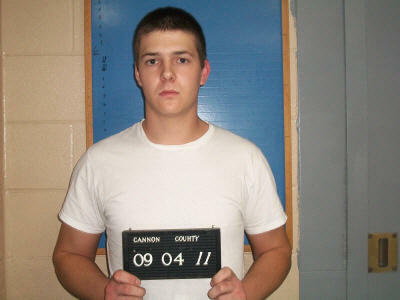 Reger was arrested and transported to the Cannon County Jail. Bond was set at $5,000. Initial court date is Oct. 4. While domestic violence does indeed need to be recognized-in doing such an article in the manner above, I would worry that by giving names, direct quotes and too much personal information- are you not feeding the anger of the accused? The whole article kind of reads as an advertisement for the deputy and the department of SAVE. Don't misunderstand, I am not saying these entities and people are not doing a valuable service- I am saying, did the life of yet another victim just become further endangered by such invasive reporting? Domestic Violence is a serious issue and should not be taken lightly. All angels need to be considered and safety must be in place before descriptive details and incidents are reported. Perhaps, an article of blacked out names could have been done or a series on such issues instead of announcing to the public a private matter that could turn into statistical ramifications . You have just humiliated the man behind the bars but in doing so you have endangered the victim! Which leads me to ask, why-on some articles can I not read the police report but on this one we all get the full details... Oh, and for future reference-having worked on a hotline-YOU NEVER give out the details where the victim seeks help, This is one story that should have been pushed aside by the editors and the director of SAVE! Valid points, all of which I have considered as an editor. Classifying the crime of assault as a "private matter" perpetuates the erroneous myth that it is OK for couples, relatives, domestic partners, etc. to beat on each other with impunity. The "anger" of the accused was not starving prior to the publication of the article. More than likely it was eating away at the perpetrator for quite some time. "Humiliating" the perpetrator can be a deterrent to future acts of this nature. However, if a person is so easily set off by a newspaper article that they repeat the offense, it will more than likely happen anyway. Based upon my observations of how domestic assault cases are disposed of in court, in a majority of instances public exposure of the actions of the perpetrator may be the harshest consequence received. Publicizing treats of future violence may deter people from following through. Sweeping incidents of this nature under the carpet likely emboldens the perpetrators. When law enforcement, jail and eventually court resources are used in this county to handle a situation, it is not a "private matter." It is one that costs taxpayers hundreds of thousands of dollars yearly. A private matter involves a disagreement, not verbal threats and physical harm. Law officers routinely refer people with problems to agencies for guidance and assistance. That could include drug, alcohol and mental issues. However, even if a referral is made, the person may not follow through. The availability of S.A.V.E. 's resources to victims of domestic violence is well known in this county. The director of S.A.V.E. and the deputy had no involvement in the writing or publishing of the article.